How do you find bridesmaids’ dresses for your girls if they’re different shapes and sizes? It’s pretty likely that your Bride Squad comes in all different shapes and sizes, which can make finding a bridesmaid dress to suit everyone a little bit tricky. Once you’ve got your own wedding dress sorted, the next big challenge is finding your bridesmaid dresses. They’ll likely all have totally different body types and their own personal preferences when it comes to dress styles and shapes, so how on earth do you keep them all happy? The first step is remembering that you don’t have to force them into wearing the exact same dress. Creating a mix-and-match look with different gowns all in the same colour or within a complementary tonal palette will leave your bride squad looking unified and comfortable in their own individual styles. Jasmine Bridal is great for offering mix-and-match dresses in a variety of flattering cuts, while Motee Maids is amazing for different bespoke styles, if you’re struggling to find something quite right for everyone. Motee Maids has gowns from a size 6 up to a size 22 and you can select different bodices and skirts to build unique dresses, all in the same colours with matching or co-ordinating embellishments. Their dresses are very true to size and the best thing is that everything’s made to order so the full choice of styles is available in all sizes, which means you’ll never have to worry about rushing to order or buy in case they sell out in the sizes you’re looking for. Next, heading to the right shops that can cater to all your bridesmaids, no matter what their size, will help everyone feel comfortable! I can personally vouch for David’s Bridal’s excellence when it comes to bridesmaid dress shopping. They stock so many different styles, lots of which are available to order in a variety of colours so creating a mix-and-match look is super easy. Everyone should be able to try on different styles in their sizes (there are sizes 0-34 on offer), and the advisor will keep you right when it comes to ordering them in the right colour. Plus, on a super practical level, the David’s Bridal Glasgow shop is massive with lots of changing rooms circled around one large waiting area. If anyone’s a bit shy about stripping off to try on dresses in front of their fellow ‘maids, they’ll easily be able to find some privacy without having to leave and miss out on the chat. Taking the time to source the right boutique and designers is guaranteed to make finding bridesmaid dresses everyone will be happy with so much easier, and it’s definitely worth it; you want them to feel great, enjoy their day and look comfortable in all your wedding pics, after all. Still looking for wedding outfits? 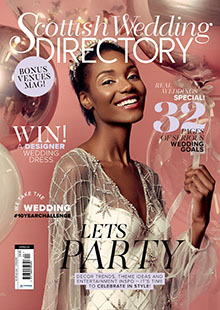 Check out our online directory for bridal, bridesmaids, mum and grooms outfits!